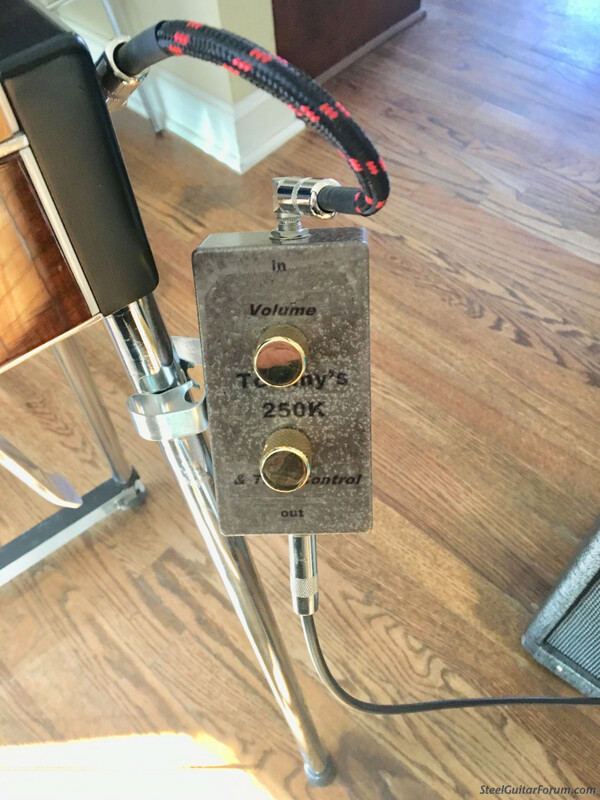 This is a volume tone control that clips on the leg of your guitar to replace using a volume pedal. I make two-one with a 250K pot for single coil pickups and one with a 500K pot for dual coil pickups. Ive added a Golden Age Treble bleed circuit ceramic capacitor to prevent treble drop off at higher volumes and a paper-in-oil tone capacitor for a vintage feel. It comes with a clip to mount on the leg of your guitar (I need the diameter of your guitar’s leg) or a Velcro strip to mount it on the end plate or deck. Satisfaction is guaranteed with a 7 day return policy (just pay shipping and I refund the cost of the pedal) and a 1 year guarantee on wiring and parts. $100.00 plus $7.00 shipping. PayPal is OK. I don’t have any of these made up so there will be a small delay while I get the parts. Steel players are so wedded to their volume pedals that I don’t know how much interest there is. I also may change the body color to a pearlized white for better visibility. I cannot imagine a steel player discarding His volume pedal at all.A volume pedal is used continually when playing and can take many years to become expert at controlling the pedal properly. There may be some interest in this device if used with a volume pedal as a way of remotely setting Your amp volume and tone. I wonder if it could be useful for those who are learning to use a volume pedal without constantly pumping it. It's a common problem. I used to punish mine sometimes. Does the tone control have a "neutral" position where it has no effect on the tone? Is it true bypass? Great idea! Pedal steel guitarists lost the volume and tone controls decades ago. I never quite understood that. Emmons and Sho~Bud had them. All lap and console steels still have them. This is not a substitute for a volume pedal. I can see using it in addition to a VP to dial back the overall volume in certain situations. Perhaps that's a good discussion for the Electronics section of the forum (not here). What is the difference or advantage of this over a Matchbox? Matchbox is a DI. I think the same company makes preamps too. Do they make a straight volume/tone control box? I have seen attenuators for twice the price as well as less than half. I like this. If I didn't already have both tone and volume controls I would consider this. I have a Goodrich Match-Bro that has a tone control in the effect off position. I also use a POD X3 for effects only. The POD X3 has a level control and I can set max level there. BTW, Tom, its been several years since we were both at a KC steel jam. Hi Jack! It’s nice to hear from you. Let’s get together next time you are in town. Another member texted me a link for a John Pearce volume control that is less than I can buy parts for. If I would have seen this I probably would have tried it. I don’t know what the volume pot is rated at but if price is an issue I would look at it. It is volume only. All of my guitars but one are single coil but I have recently been playing the 500K with those guitars. The sound is very in your face but the volume control has slightly less travel or taper in increasing volume. I do like the tone. Last week I played a gig with the volume/tone control and did not use a volume pedal. The only song that I missed the volume pedal on was Sleepwalk and seriously-how many gigs are you asked to play Sleepwalk? I had to talk the band into it as a set-ender. The other instrumental we did was Buckaroo. No need or time for a volume pedal there. My point is try playing uptempo stuff without a volume pedal at home. Give it a week or two and see how much you miss it. Finally, some have suggested that this be used with a volume pedal as a quick boost or damping of overall volume. I did wish I’d had both on Sleepwalk and I intend to experiment using both. With the treble bleed cap I don’t detect a loss in presence. Try going straight from your pedal to the amp and then switch to going from the guitar direct to the amp. When I do this I have to dial the volume WAY down. I like being able to control that at the guitar. I also notice a change in the shape of the sound from my standard floor volume pedal. Just some thoughts. Great idea and great looking product Tom. 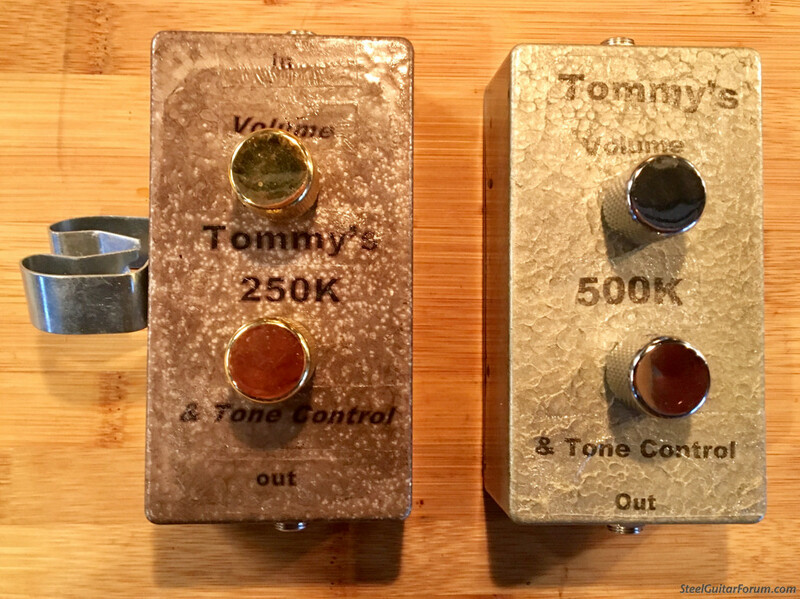 Unlike the Pearse unit, which is just volume, you are offering a steel player friendly volume and tone unit with both 250K and 500K ohm values that clips to the steel leg...and built by a forum brother. Besides steel, I can see several uses for this device. F.I. with a reso or acoustic guitar or other instrument that just has a condenser or piezo without any controls. Can use the clip to attach to a mic stand etc. As one who builds a few devices myself, I can attest to the investment in quality enclosures, jacks and controls. Good materials are costly. Price is very fair considering the cost of other similar devices. I wish you good luck and success with these.